After a vicious weekend of assembling IKEA furniture and hanging pictures, we were very excited to have Sunday dinner plans at A & A’s place. In my French lessons, my teacher (who doesn’t speak a word of English to me), has me talk about daily life in Geneva. I talk about the house, Gabe’s job, and things I do during the day. Last week, I was attempting to tell her in French that “we met some nice people on the bus, and we went over to their house for potluck,” describing our delicious American BBQ at their place. “Comment dites-vous ‘potluck’ en français?” I asked. The funny part of a Canadienne buffet is taking your items on the public transit. Below, Gabe captured a shot of me toting the caprese salad while waiting for the bus. Apparently, it is not normal to carry a platter of food on the bus in Switzerland. Oh well, I am not a stranger to odd looks from the Swiss. This Sunday, the theme was Mini Pizzas. A had whipped up an amazing selection of toppings. From everything to homemade sauce, to all the workings of a BBQ chicken pizza, it was incredible. Gabe and I think this is best pizza we have ever had! In addition to the delicious Italian fare, it was just a very enjoyable evening spent with great people. Gabe and I are excited that we are finally almost done settling so we can host next time at our new place. I am thinking ours will be a Mexican themed Canadienne Buffet….we’ll see…you’ll have to keep reading for all the updates! 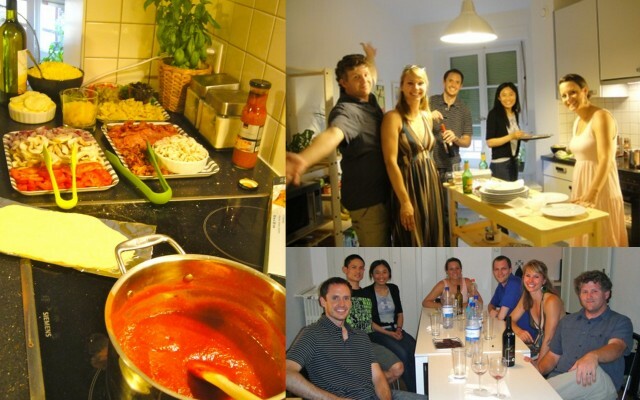 Also, share any of your best potluck ideas for us – we’d love to hear some suggestions! This entry was posted in Canadienne Buffets, Food, Wine & Beer, Life in Geneva, Summer. Bookmark the permalink.